Coming off of of a big year that included venturing to different regions in the Midwest, Jared Daniels-Block's Gateway Fighting Series undertook the most ambitious show to date by booking New Years Revolution II at the 10,000-seat Chaifetz arena in downtown St. Louis. 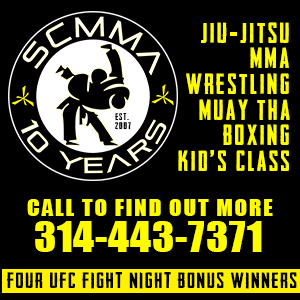 Familiar and new faces were featured all over the card that included MMA, amateur kickboxing was headlined with professional kickboxing bouts. Main eventing the show was experienced striker and Bellator veteran Darryl Cobb, coming off of a victory at Bellator Dynamite 2 in St. Louis this last June, giving up considerable height and reach to the taller and always game Scott Futrell. Futrell last saw action in September winning a short notice MMA fight. Cobb immediately took the center and there was not much of a feeling out process as both fighters looked to impose their will. Heavy handed Cobb looked to get inside and land power shots and close in off his jab. Futrell looked to stay long and put Cobb's back on the ropes and stalk him around the ring while cutting him off. Cobb and Futrell both had moments where they were successful in these approaches in all three rounds. The fight was very entertaining and there were times when Futrell kept his range well and landed solid combinations and kicks, and also times Cobb was able to blitz in and come over the top with power. The decision at the end of the bout declared Scott Futrell the winner, his range and use of his length was enough to tip the decision his way. Check back here tomorrow for interviews with Scott Futrell and all of the professional main card victors. 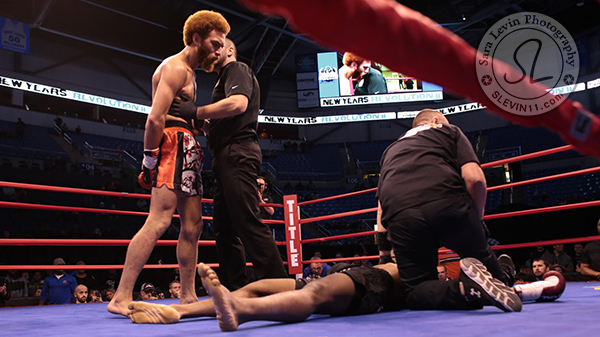 UFC veteran Josh Sampo returned to action via the route of kickboxing against Ohio's Tyger Banks. The rangy Banks showed very traditional Muay Thai with a multitude of kicks and was trying to land strikes at the end of his punches to keep the shorter Sampo at bay. Sampo looked to close the distance and do damage to the body early on, finding the most success towards the end of the round as he put Banks's back on the ropes. Sampo had a lot of success in the second round showing good defense and landing effective combinations and even some kicks on the calf of Banks, one that sent him to the canvas. With the fight appearing at a round apiece going into the third, Sampo continued to bring the pressure forward and get inside the reach of Banks. Sampo caused damage to the lead leg of Banks that was visible, and as he looked to keep attacking it he was switching up combinations that helped him close the gap inside. When it was all over with Sampo won the decision, earning the victory over Banks in his return. Knuckle Junkies Breakout Fighter of the Year Luis Pena, finishing 2016 with a quick 2-0 record in MMA, took a fight against Rome Lindsey on a couple weeks notice. Pena lives at the gym and jumped at the opportunity to test out his striking in a professional contest. Lindsey came out firing multiple kicks on Pena and brought a quick storm that Pena endured as he looked to establish his range. Lindsey injured his foot on a checked kick but found enough adrenaline to recoup before the 10-count. Pena welcomed him back to the fight with a combination followed by a highlight reel switch flying knee KO that produced a sickening thud as it landed on the chin and left Lindsey out cold on the mat. Pena continues building momentum early into this year. Local kickboxing standout Drew Gigax ouf of Jermaine Andre's Academy stood across from Oaklahoma's Grayson Culbreth to headline the undercard of the kickboxing prelims. Gigax dropped Culbreth with a solid cross early, upon getting back to his feet Gigax then fired a body kick that wrapped Culbreth's torso like a seatbelt and cut the legs out from underneath him. The fight ended there as the referee waived off any continuation. Gigax won in 1:10 of the first round by TKO in impressive fashion. Calvin Williams and Brandon Breault had a scrappy first round that saw Breault land some heavy round kicks early, a few as Williams circled out into them, adding to their effectiveness. Williams looked to use his reach advantage and cut off Breault as the fight wore on, and he gradually was getting the better of exchanges until Breault fired a kick that made Williams's leg give out and send him to the canvas. Upon returning to his feet Breault again dropped Williams with another leg kick. Looking to do the same one last time, Breault stepped in, but this time Williams unloaded a straight right hand that dropped Breault to the floor. Breault shook it off and continued as the fight went the little bit of duration that was left. Majority decision when read went to Brandon Breault. Savannah Shahan was able to swarm and hurt Melissa Shepard after some intitial back and forth in the first round, and then found the final shot to send her to the canvas, earning her the victory by KO. Nemesis Fight Alliance promoter Beejay Smith decided to step back into the ring when the opportunity presented itself and found himself matched against granite-chinned Sam Stevenor. It was a definitely crowd pleaser as Stevenor kept walking forward while Smith looked to counter and score off of Stevenor's pressure. Both had moments of offense, but Smith definitely appeared to have the experience advantage as he continually baited Stevenor into following him into setups to land strikes. The crowd went crazy as the fight came a close as both fighters were exhausted on their feet and still kept pushing. 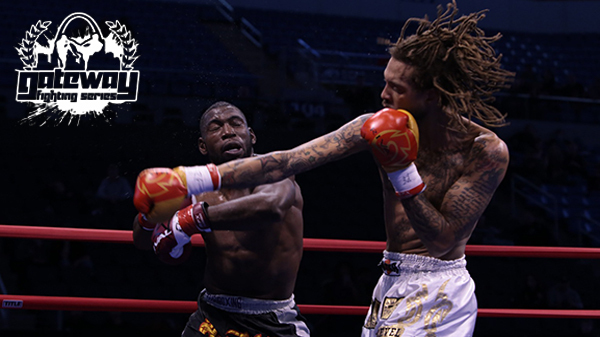 In the end Beejay Smith was declared the winner by unanimous decision. The Hit Squad's Izzie Robinson and Katelyn Jesse squared off in a kickboxing bout that was originally supposed to be and MMA match. The two stayed fairly measured, but the key moments in the bout were landed bye Robinson when she landed a couple effective overhands and body kicks. Jesse tried to use her reach advantage and jab, but never seemed to find any longer chain combinations to effectively throw. The two had multiple exchanges, with Robinson getting the best in the majority of them. After the time ran out, Izzie Robinson was declared the winner by unanimous decision. Starting off the kickboxing portion of the ammy undercard was Chuckie Brooks taking on Mark Kirkland. Very early on Kirkland landed a couple of hard kicks to the body of Brooks that left a visible welt on him, and then accompanied that by landing a punch to the body of Brooks that caused him to take a knee and created a standing count. Brooks was able to endure the round to recover. The second round was a lot more competitive as Brooks found his resolve and was able to land some solid shots and find some success in what was an even round for both fighters. The third round both fighters came out throwing with heat, and in a back and forth flurry between the two a cross from Kirkland landed on Brooks as he was backing up, the added momentum in the direction sent him to the mat and provided a 10 count that Chuckie had to answer, giving the round to Kirkland. The knockdowns were the difference as the fight came to a close and Mark Kirkland was declared the winner by unanimous decision. MMA in the four cornered ring is a throwback that can provide some good theater for fans, albeit a wildcard when it comes to grappling exchanges. The most anticipated fight on the MMA portion of the undercard took place between two young top talents in Corbin Howard and Steven Coleman. Howard landed a couple hard body kicks early as the two measured each other before Howard ended up on top in a scramble. Coleman was able return to his feet and looked to slam Howard to the mat, and as the two continued to scramble on the ground to close out the round Howard landed a few hard shots that opened a cut over Coleman's eye. Coleman initially stuffed the shot by Howard to start round two, but on a second attempt was able to land a hip throw. Coleman was tried to fight up by attempting to ride single leg from bottom, but Howard responded and looked to transition to different variations of an armbar. Coleman fought them all off and from a variation of a front headlock position hit Howard with a powerful knee to the body and some clean punches. Howard scrambled and finished the round on top as the two tangled up in the ropes. Howard came out firing kicks to the head and body of Coleman in the third before looking to shoot for a takedown. Upon readjusting to the middle of the ring, Coleman landed a nice belly-to-back suplex of Howard. Howard was able to get back to his feet, but Coleman kept a good body lock and landed knees to the legs of Howard. The match went the distance, and the judges gave a unanimous 30-27 decision to Corbin Howard. Raja Singh showed some impressive ground work in a match-up against Dylan McCollum. A quick takedown by McCollum on Singh put himself in trouble early. Singh went right to work quickly and transitioned to a very tight armbar that looked close to breaking McCollum's arm. McCollum was able to initially toughen out of the armbar and pick up and slam Singh back to the canvas, but upon hitting the mat again Singh was unphased and quickly secured a triangle choke that forced the tap from McCollum, making him the winner in the first round. Richard Jones looked to close the gap early on Rodney Cotton, pressing him to the ropes and looking to land knees. Cotton was able to secure a Thai Plum and return some knees of his own back. After more of the same type of action to start the second round, Cotton found the moment to lock on a standing guillotine that forced Jones to submit. After a first round that saw him on bottom taking some damage, Jacob Cruzen was able to take control of the fight against Cody Weder in the second round. Cruzen found himself landing some good ground and pound until securing a rear naked choke submission to give him the victory to lead off the show.